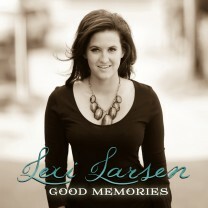 Lexi's Debut Album, "Good Memories"
Lexi Larsen-native Nebraskan, soulful country crooner, entertaining performer and— the next big thing! There are a lot of ways to describe up and coming country music sensation Lexi Larsen, who is collecting accolades and fans on her way up the charts, but there’s certainly no replacement for seeing her perform and hearing her breathtaking music firsthand. This small town girl turned Nashville songstress, is currently making music and writing songs with the boomtown’s top songwriters. Her first single, “You Can Leave,” rose steadily up the charts, reaching 37 on the Music Row Chart and 53 on Billboard Indicator—- an impressive feat for any indie artist. Just ask her fans! Her followers are so passionate they solely funded her first album, Good Memories, and made the music video for “You Can Leave,” which was featured on CMT.com and GAC.com possible—all through Kickstarter. Lexi Larsen is proving she’s the real deal—the singer has sold out shows in Nashville and was chosen as the first Brand Ambassador for Durango Boots. Lexi has been performing at fairs and festivals and has opened for Jon Pardi, Dwight Yoakam, Phil Vassar, Restless Heart, Emerson Drive, Love & Theft, Ricochet, Ronnie Milsap and the Dirty River Boys. She also was invited to sing the Star Spangled Banner for the National Finals Rodeo in Las Vegas, performed at the famed Venetian, and traveled overseas captivating crowds in Xian, China! To add to the momentum, Lexi just released her EP titled, “Shakin” featuring three new songs she co-wrote including Jesus and Me, If I Was Bad and Shakin'! Lexi was named as One to Watch by CMA Magazine and was just awarded Female Vocalist of the Year at the IHeart Rocky Mountain Country Music Awards. Since the release of her first single, radio stations all over the country are tuning in to hear what’s next. What’s next for the rising star? Lexi is set to depart on her seventh tour through the Midwest and Northeast. She has assembled a fantastic band in Nashville and they are ready to tear their way through the heart of the country, greeting old fans, making new friends and sharing her music.